Editor’s Note: John Olsakovsky is becoming quite the regular contributor of op-ed pieces to OpenPaddock.net! This week, he shares a careful-what-you-wish-for piece concerning the recent craziness in the NASCAR world. Do you have a rant or rave you’ve been itching to share with the world? Send it to Shaun at wfp@openpaddock.net or to Doug at doug@openpaddock.net and we’ll get it posted here at OpenPaddock.net for all to read and enjoy. After all, we are all about motorsports commentary for the fans, by the fans! You Wanted Old-School NASCAR? Michael Waltrip wants to bring it to you! Let me preface this by saying that I’m not a NASCAR fan, specifically. I follow NASCAR and watch the races that interest me or are on when nothing else is on. I watched the Richmond race mostly because Sprint Cup cars on short tracks are usually exciting. Well, the Richmond race was mostly dull, by my standards at least. The last 25 laps or so notwithstanding, the real excitement came during the two days following. If you’re a race fan of any sort, it’s almost impossible to not know about the findings of NASCAR and the penalties levied against Michael Waltrip Racing. Without questions, the actions of the MWR organization as a whole were reprehensible, but I’m not the one to judge. That’s NASCAR’s job, and they have done so, regardless of anyone’s personal opinion of said judgment. I’m not the only one to compare “Spingate” to the Piquet, Jr. wreck when he drove for Renault, under orders from Flavio of course. I belive the comparison is valid, as they were both orders for one driver to “take one for the team”. Piquet ate a wall. Bowyer scratched his arm. What I fail to understand is the general state of disbelief amongst the NASCAR community that something like this would ever happen. 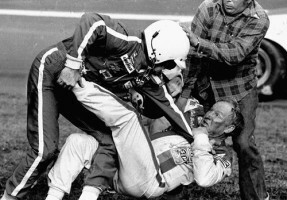 You can’t tell me that early NASCAR drivers, mostly the families of outlaw moonshine runners would never pay off a team to spin out an opponent. I’m sure in those days, the manufacturer reps would give a little extra to the team running their motors if they would hold up a rival chasing down the leader. I’m not condoning these sorts of deals. I’m just saying they are part and parcel to professional racing. Wherever there is big money, there will be skullduggery. Most of the time it goes unnoticed, but occasionally there’s a whistle-blower or damning evidence like Vickers “WTF?” response when he was told to pit late in the race. The obvious: There’s a crapton of money involved. Money makes people do stupid things. In this day and age, the level of scrutiny in sports is so high, it’s almost impossible to do something shady and not have it be observed, recorded, photographed or reported on. The collective actions of Michael Waltrip Racing were honestly, complete buffoonery. Reading accounts of what NASCAR says took place almost seemed like a scene from a Marx Brothers movie. I laughed in my coffee when I read what happened Monday morning. Mikey needs to think old-school, too. He should seek advice from successful team owners like Bud Moore or Ray Fox. What old school tomfoolery will Michael Waltrip attempt next? I’m hoping to see Clint Bowyer channel Tim Flock and drive with a monkey in the car. Dress it in camouflage and blaze orange. Maybe name it Uncle Cy. Just keep it away from the 5 Hour Energy shots. MWR should have had their NASCAR franchise revoked. The only problem is it still effects guys like Vickers and Truex, who seemingly didn’t know what was going on. Any way around it, MWR has a history of such shenanigannery, and Waltrip is the biggest douchenozzle in the NASCAR garage.